Versatile quartets of vivid, high intensity powders put together to color, shape and highlight your eyes like never before. Use the smooth glide on eye-liner pencil for easy application & comfortable grip. Jojoba oil and Vitamin E moisturizes and nourishes the skin while its soft and creamy texture make it easy to blend and perfect for the all time favourite smokey-eye. It lasts longer and is safe to use. Lakmé Nine to Five Impact Liner comes in four bright vivid colors. Trace your eyes with its gel based texture & make way for smudge free, bold eyes. Shine on at work and after with these handy bright liners anywhere for instant shimmer and subtle shine. Soothes your eyes with camphor and castor oil. Innovative manufacturing technology for perfect blending of ingredients to give a smooth finish. 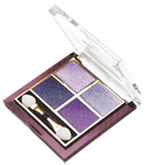 • Lightweight and comfortable eye make-up for perfect definition. • Water-resistant formula ensures no smudging or smearing. • Deep intense color that does not fade. • Pencils that outline the eyes to make them look sharp. • Available in different shades to make your eyes enticing. • Easy to sharpen and use. The new Lakme Eyeconic Kajal by Lakmé is literally iconic as all you need is one sweep of kajal and it lasts for 10 hours. 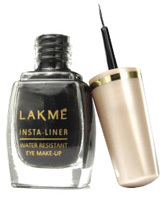 The Lakme Curling Mascara gives the eyes an intense black finish and comes equipped with a curling brush that helps give curves to your lashes. Outline, define and intensify your eyes in one easy stroke. Bring out the artist in you. Create wings or bold, structured eyes. Eye Artist is a unique foam tip eye liner pen that gives you complete control and precise lining so you can experiment till you get that ultimate, dynamic look.